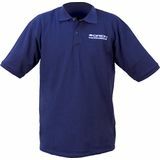 A personal favorite of the company president, the Orion Logo Polo Shirt is what many of our staff members wear to work and in our online videos. Stylish, durable, and machine washable. Available in Small, Medium, Large, XL, and 2XL.